Every successful business in the world was well planned and thought out, there is no successful business man in the world today that never plan for his business. If you have never created or know what a business plan looks like at the end of this post you will be able to write your own business plan. At the end of this post, you will have a full idea of how a business plan looks like, important things to add and how to write your own business plan. 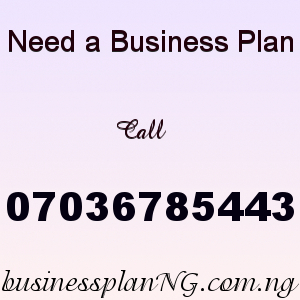 What is a Business Plan – There are several definitions but in simple term, a business plan is a guide or road-map on how your business should go, it is an outline of goals and details of the business and how you plan to achieve those goals. It is also a formal written document describing the nature of the business, the sales and marketing strategy of the business, the financial and operational viewpoint of the business. Not all successful business in the world started their business with a well written business plan or feasibility study for the business, as important as a business plan is, its not a guarantee that a business must be successful, however part of the success of your business depends on the information you gather from a well written and detailed business plan. When it comes to business knowledge alone is not power but potential know is, what you know about a business will not help you are make you rich but what you put to work in that business is what will help you and that is one of the most important thing about a business plan because it gives you a clear cut understanding about the business you intend to venture into. There is a little difference between a feasibility study and a business plan. A good feasibility study is done with the purpose of finding out the profitability and work-ability of a business venture. Feasibility study is filled with analysis, calculations and estimated projections and should be completed prior to the business plan while a business plan is made up of mostly tactics and strategy to grow the business. Feasibility study gives you the capacity to make informed decisions about the projected success of the business or project from a financial and non financial perspective of a proposed business, project or concept. It objectively analyze quantitative and qualitative data, undertake in depth market research, identifying appropriate marketing opportunities, address market demand, supply and pricing trends, growth trends, competitive analysis, economic and sector overview etc. 9. Financial Predictions Including, Income Statement, Cash Flow Statement, Balanced Sheet, Break Even Analysis and Capital Requirement. The first thing to do before writing a business is to find a business that is similar to the one you intend to start. There is no way you can get an exact business so finding a similar business is a good start because all business can never be the same. Every business has a different marketing strategy and tactics, different location etc so instead of looking for a business plan that is exactly the one you want to start you can look for a business that operates similarly to how you want your own business to operate. In writing a good business plan you should write a business plan that is right for your business. This is very important because if the business plan is not right for the business you intend to start you are less likely to get the necessary financial aid that you need for that business and you have also reduced your chance of success because the business plan is the right one for the business. Creating a business plan means you are going to think of how to build your own business. The kind of management team you need to have so you can grow your business successfully, the kind of marketing strategy and tactics you are going to use and how you intend to be unique in your way of delivering your business that is different from others. When all of these things are in your business plan, then you are ready and good to go. One common mistake people make is that after they have acquired a good business plan, they drop and with time forget important information embedded in the business plan, a business plan is a tool to grow your business. For Business Expansion, Evaluation and Reorganization – This is a very important reason to write a business plan because for a business to grow, it is not enough to have meetings and share ideas, you need to have a well written document that will detail new business opportunities and model they need to invest in. For Fund Raising – To start a good business require funds and that is what a good business plan can give you. It can bring investors and venture capitalists your way and you can acquire bank loan when you have a well written business plan. To get a coperate organization or individual to invest in your business you must have a good business plan that can convince them that the business is feasible and can make profit. If you are going into a new business it is very important that you conduct a good research about the new business you intend to venture into and that is one thing a good business plan and feasibility study can do for you. Never go into a business you know nothing about without conducting enough research and investigation about the business so you can know the dos and don’t s about the business.